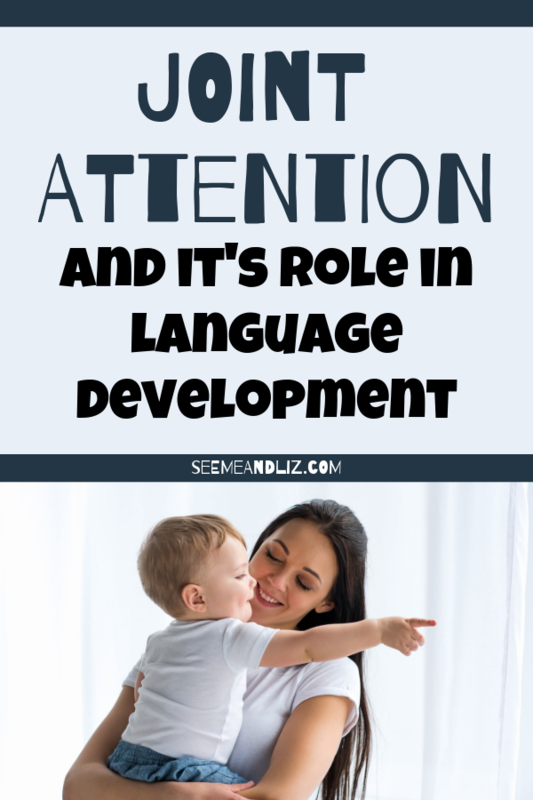 Seeme & Liz > Parenting Tips (0-2 year olds) > What Is Joint Attention And Why Is It Necessary For Language Development? What is joint attention? What made you wonder about this term? If you are a parent of a child with a speech-language delay or autism then you may have heard it before. However, it’s is a term that all new parents should become familiar with. This is because joint attention is a precursor to spoken language. In simplest terms, it is when 2 individuals have their attention on the same thing (this can be an object, person or experience). Another term which is sometimes used to refer to joint attention is shared attention. One individual gets the others attention through eye gaze, gestures (pointing), vocalizations or words. The end result is both people looking at the same object, person, event, etc. and then looking back at one another again. The key part of joint attention is the ability to share eye gaze with another person with intent. It is the basis of back and forth conversations that will occur later on. When Do Children Start Exhibiting Joint Attention? 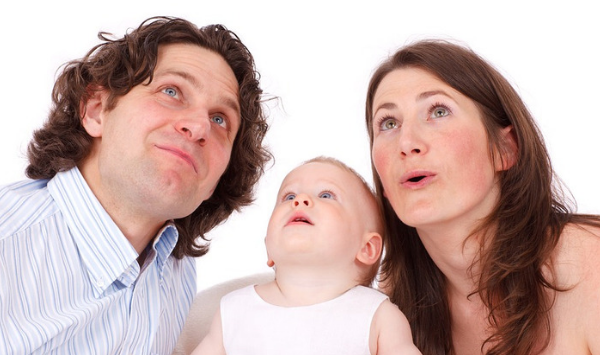 In its most basic form (sharing gaze, making eye contact), joint attention can be seen when babies between 2-3 months old interact with their parents/caregivers (Reddy, V. 2005). The infant looks at the parent when the parent is speaking. However, it isn’t until 6 months or later that intentional joint attention begins emerging. A neurotypical 6 month old will be able to follow the gaze of his parent by turning to whatever the parent is looking at. At about 8-9 months, babies begin pointing. They will point as well as use eye gaze to get someone’s attention to the object they are looking at. But don’t worry if your child isn’t pointing yet, some children don’t point until they are closer to 12 months. As long as your little one is using eye gaze to draw your attention to an object of interest, everything is most likely fine. Once a baby is over 9 months you will see gaze checking which represents true joint attention. Gaze checking means that the baby will look and/or point at something and then look to a parent/caregiver to see if the parent is also looking at the same object. Children on the autism spectrum often struggle with joint attention which can make it harder for them to develop functional language skills. 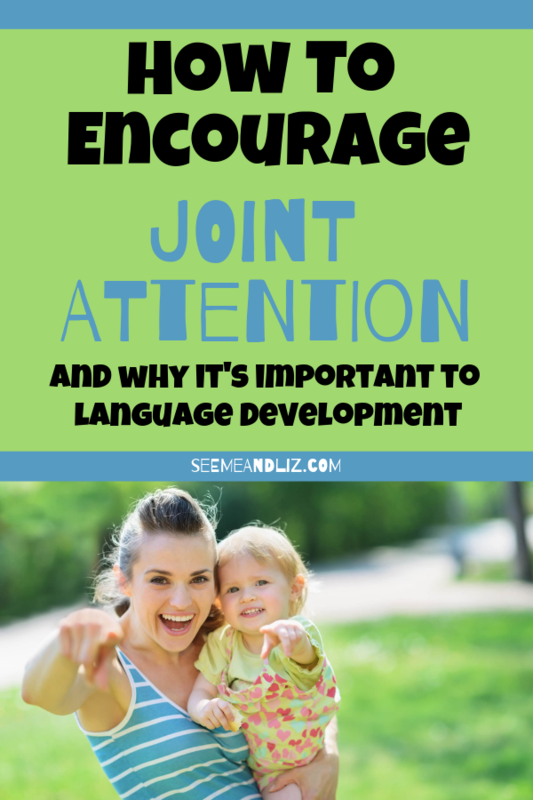 Joint attention is important for language development, specifically understanding and producing words as well as learning new words. It is one of the earliest predictors of future language skills. The words that children hear during an interaction involving joint attention are strongly linked to their vocabulary development. For example, a 12 month old has drawn his mother’s attention to a ball. The mother can respond in a few different ways. One could be to ignore the communicative attempt or respond with something like “ya, I see it”. Alternatively she could respond with “oh, you like the ball, do you want to play with the ball? Let’s throw the ball”. The second interaction will lead to a lot more learning for that child. He has heard the word ball 3 times! It will be a lot easier for him to learn and eventually say the word “ball”, because he now has a reference. Some research has also shown that when joint attention occurs during book reading, it can be linked to reading ability and further language learning as the child gets older (Visual Language and Visual Learning Science of Learning Center. (2012, June). Eye Gaze and Joint Attention (Research Brief No. 5). Washington, DC: Amy M. Lieberman). Don’t panic, but be on the lookout. In the next section I will list some ideas that you can implement to help your little one develop joint attention. A child needs to do certain things in order for true joint attention to be observed. For example, a baby needs to be able to attend to and look at a communicative partner, she needs to be able to follow another person’s gaze or pointing, she should be able to look from objects to people and vice versa and finally she needs to be able to get another person’s attention shifted to whatever it is she is interested in. Bhat, A.N., Galloway, J.C. and Landa, R.J. (2010) found that children who do not develop joint attention skills are more at risk for developmental delays, specifically with respect to social skills and language development. If by 12 months your child is still not showing any attempts at joint attention (eye gaze, intentionally drawing caregivers attention to an object of interest, pointing, etc.) it is time to bring this up to your child’s doctor. If your child is also not using any words or word approximations (e.g. “bah” for “ball”), a full speech-language assessment would be warranted. You are your child’s best advocate, so if you feel that something isn’t right, push to have your child assessed by the appropriate professional, in this case it would be a developmental pediatrician or a speech-language pathologist. How Can I Help My Child Improve Joint Attention? Social skills are a fundamental part of language development. A large reason for speaking is to communicate with others. Therefore, a child must learn how to interact with others non-verbally before spoken language will happen. Communicative intent (i.e. A reason for communicating) must be present in order for spoken language to follow. ♥ Point often when you are talking to your child. ♥ Make a point of turning your head to look at an object of interest while pointing and verbalizing what you see, for example “look at that big ball”. ♥ Hold up a toy you know your child likes and say “look”. ♥ Use hand over hand guidance (if your child will allow this, don’t force it) to facilitate pointing. This means taking your child’s hand and isolating his finger to make him point to an object. A good time to work on pointing is during book reading. You can point to a picture while labeling it, for example “there’s a dog”, then ask your child “do you see the dog?”, at this point you could use hand over hand to have your child point to the picture of the dog. You can also do this when you and your child are looking at some of her favorite toys. ♥ Follow your child’s lead. If your child is interested in something they are more likely to point it out to you as well as engage with your more. You can show interest by commenting on the toy while pointing, for example “you like the teddy bear, he’s so soft”. You can take it a step further by pointing to your eye and then looking at the bear. ♥ Play hide and seek with a favorite toy. Let’s take a toy truck as an example. Make sure your child has seen the truck. You can say “look at the truck” while pointing to it. Wait to see if your child will look at the truck (and maybe even point to it). If this doesn’t happen, point at the truck, look at the truck and say “there’s the truck”, make sure to look back at your child. At this time you can take his finger to point to the truck if he isn’t doing so himself. Again, this works best if your child is actually interested in the toy. I hope that I have answered the question “what is joint attention?” for you. I have tried to keep the information as straightforward as possible, because honestly all of this stuff can get quite overwhelming. If you have any questions or comments, please share in the comment section below! Very interesting. This is something anyone with kids is familiar with, but I never knew it had a name. My earliest memories are reading a book with my mother. Is it any wonder then that now I’m an online author blogging hundreds of thousands of words each year?! Thanks for your comment TJ. Most parents naturally do these things but don’t really understand why. It is good to understand these parents of child development because then it is easier to know when and why a child may be behind in certain developmental milestones. I learned a lot about Joint Attention by reading your excellent article. Parents have to keep a lot of attention and knowledge about baby’s development in order to successfully raise their child. Many of us are unaware of Joint Attention. Due to this ignorance, parents are often unable to seek the advice of a child’s doctor timely. Even I heard about joint attention the first time. But after reading the details, I’m really benefited. Your links included in the article are helpful as well. Thank you sincerely for the useful post. You’re welcome Ranao! It is good for parents to know about these more salient milestones. But I also don’t want to scare parents and think they need to read every parenting article written. It’s a fine line and parents just need to do their best and know when to ask for help. You did a great job with this educative post. I have learned a lot of things here. As a trained childrens counselor with a missionary organization, I consider having this knowledge essential as my work entails working with children with varying disabilities from 3 months upwards. Knowledge of joint attention by parents and caregivers would enable them to help kids with speech/ language development delay. The tips on how to help a child improve joint attention are highly valuable. Thanks Tolu! I’m glad that you have found the information in the article helpful. The kids you work with will really benefit from these skills! Initially when I saw ” Joint Attention ” I was eager to read through to understand what you were trying to pass across. When my first son was 10 months, he actually used to give me some funny looks but then I just give a smiling look back. I never knew all those moments were important in the life of a child. I have really learned something new today and henceforth am going to nurture my 2 months old baby in this aspect. This is one of the most amazingly informative and expository things I have read today,more so I need this info more as a mother of a young baby, stumbling upon this has made me more knowledgeable .Thanks for the write up. I’m happy to hear that this information has helped you as a mother. I find it fascinating how babies and young children learn and love sharing this information with parents! I absolutely love what I read in this insightful article because it is full of great information. This is fascinating and interesting to me. Every parent should understand joint attention and how to develop this skill. Children tend to relate with their parent happily at their early stage. You have done a great write-up by putting this together. Wow what an article. I thoroughly enjoyed reading it and also enjoyed learning from it. It is a very interesting topic that anyone would be interested in whether they have young babies or not. Most of us interact with the babies of our relatives and friends and you can count on me that when I get together with my girlfriend this weekend both of us will be practicing joint/shared attention with baby Alexandria. She is at the right age for it too. I have done this before and seen others do it too, but I was not aware of how important it was to a child’s development. I will direct my friends with young kids to your site as well. How long after 6 months should we continue to practice shared attention? Is there a cue we should be looking for that would indicate that the child has reached a developmental milestone and we can reduce the frequency with which this practice continues? I like your site. Keep up the good work. Thanks for your comment. You will naturally notice as babies develop and gain words that the pointing and eye gaze start being replaced with words. Don’t worry too much about it and keep the interactions natural. You don’t want to end up trying to do a therapy session around joint attention for a typically developing baby. This article is greatly filled with helpful information for parents and soon to be parents. I must commend you for taking your time to to provide such straightforward information about joint attention and autism. All the information is just simple for understanding, but I want to ask if deafness in kids can be discovered earlier like 5-9 months of age? You’re welcome! I am in Canada and many provinces here offer newborn hearing tests in the hospital which would check for deafness. So it really depends where you are. If you ever suspect your baby isn’t hearing properly mention it to your doctor. The earlier a hearing loss is detected the better! I just learned what joint attention is and it is a very information for me because I am expecting a child in a few months. I want to be completely prepared in all facets of parenting, so that I would not be found wanting in bringing up my little girl. I appreciate your article on joint attention and I have bookmarked it so that I can reference it when I need to refresh my memory. Congrats on your pregnancy! Becoming a new parent is exciting but also overwhelming. Do the best you can and use articles such as this one as some guidance. This is a really awesome post! I’ve just found out that I’m going to be an aunty soon, so I’ve just started doing some reading on babies and I’m really surprised at all the information there is out there that explains all that young ones go through, as well as helping parents understand what is to be expected at different stages. Thanks for sharing this article! Congrats on becoming an Aunt soon Josie! I am glad to hear you found the article helpful. Thank you so much for such a detailed post about joint attention. I’m always the busy type with my business because I’m self employed. But whenever it comes to the issue of raising my children, I leave everything else to attend to them. I did exhibit and work on joint attention with my children. Though, to be honest I never realized what it was I was doing and that it’s such a huge phenomenon like this. Thank you for sharing this post, you did a very good job highlighting everything in a simplified form. You’re welcome Derrick! Many parents naturally do the things I have discussed in the article without even realizing it. But if a child is falling behind developmentally it is good to be aware of these milestones most people overlook or are unaware of. Hi Tanya, I’m glad I came across your blog, it’s very informative and well explained. I’m a BASLP student, and I’m looking for some information related to how music could be great influence for child’s attention and language development. If you have any kind of knowledge about it, please do share it with me. Glad to hear you life my site! Unfortunately I do not have any information regarding music influencing attention span and language development. Good luck on your search and with your classes! While reading your article I started to question something … Is it possible that some children need more attention and more interaction to develop their language skills than others? I would imagine that they do differ in such a way. As for my children: my oldest daughter showed a LOT of joint attention from about 3 months on. When I’m looking photos from that period I am amazed every time, how intense her looks were and how much interest she had in her eyes! Instinctively I talked and sang to her a lot about the things we observed together. I really don’t know why I did it. I think it had to do with my learned communication patterns (my mother does the same thing with small children, and strangely I sometimes feel overwhelmed with her talking 🙂 ). Would you say that we all learn to communicate in our families and take on some patterns? Thanks for your comment Spela. You’ve asked some great questions. Yes, some children do require more attention and interaction than others in order to learn language. Many studies have been done to look at these differences, but they have found it very difficult to pinpoint exactly why some children pick up language with ease while others need to be taught more explicitly, assuming these children are of neurotypical development. In the case of children diagnosed with Autism, Down Syndrome and other developmental delays, speech and language difficulties are to be expected. To answer your second question, children do learn from their parent’s communicative style. This has been proven in studies which have looked at children from low socioeconomic backgrounds vs children from middle to upper class families. What these studies have found is that children with middle-upper class parents tend to hear more words with more complexity than those whose parents fall into the lower class category. While this isn’t always the case, it is quite prevalent. Hi Tanya, this is a very comprehensive article on joint attention. I have always taught or nurtured this skill in my own children but without realising that it was such an important thing, or what it was called. Most parents facilitate joint attention without really knowing it. My hopes for this article is to show parents that a lot goes on in a child’s development before they are able to start speaking. Language is a very complex thing!